People love their pets as much as their children so finding a good Boarding Kennels is essential. Whinney Hill Kennels offer superior levels of care and one to one attention to every dog that they house. We’ve recently had the pleasure of building a website for the Kennels which includes information on the rates, location, team photographs and galleries of pampered pooches. 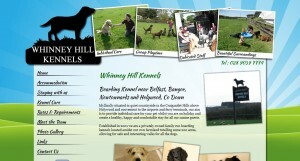 Whinney Hill Kennels also make use of social media by promoting their business on facebook and youtube.